Of course, Robyn doesn’t write and record the sort of music I generally like. She’s primarily a techno, electro-pop artist, though she does know her way around a ballad. So I guess it’s to her credit that I enjoy the two albums of hers that I own as much as I do. ‘Bum Like You’ is a track from her celebrated self-titled 2005 disc (which actually came out ten years after her first album and represented a major shift in her sound). These beats are the definition of infectious. 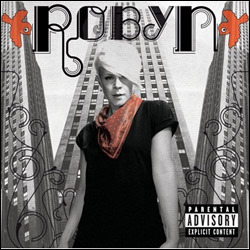 I guess the highest compliment I can pay to Robyn is that when I hear her songs I wish I was the kind of person who listened to music like this more often. This entry was posted in song of the day and tagged Bum Like You, Robyn. See, you wish you were the type of person who listened to music like this more often, and I’m happy that I’m not that type of person. :) Just not my bag, man. 🙂 I love the way you close this blog post, but I think I’m in agreement with Dana, at least in theory. Usually when I hear a song like this one – or “Barbra Streisand” by Duck Sauce, the other dance song that has been infecting my brain since the episode of Glee a couple of weeks ago – – I do wish I had an alter ego who wanted to engage in the fun all those crazy people are having 🙂 But, ultimately, I’m happy to enjoy the experience vicariously, the song for the minutes it is playing, then head back to “my” music. As for EW’s love affair with Robyn, I have been intrigued. But still not intrigued enough to want to own one of her albums.